Why Sit on a Stability Ball at Work? Over the past 10 years in personal training, I have worked with many clients with undiagnosed low back pain resulting from a sedentary lifestyle. This is probably the most preventable cause of low back pain. Despite our efforts to stay active by exercising 3-5 times per week, normal everyday activities such as sitting in a vehicle during a commute, sitting at a computer station, sitting down to a meal (do you see where I’m going with this?) can cause muscular imbalances that can contribute to low back pain. When seated, the muscles that make up your hip flexors group (the muscles that allow you to bring your knees closer to your chest) and your hamstring group (the muscles that allow you to bring your heel closer to your rear) are both in a shortened position. Both of these muscle groups attach to your vertebrae in the lower lumbar region of your spine. Over time, these muscles will become tight and short creating a tug-of-war type strain on the low back musculature. Flexibility and core training is typically the solution to preventing and treating low back pain from an undiagnosed prospective; however, you can start by simply just changing your seat for the 7-8 hours that you are at work each day. 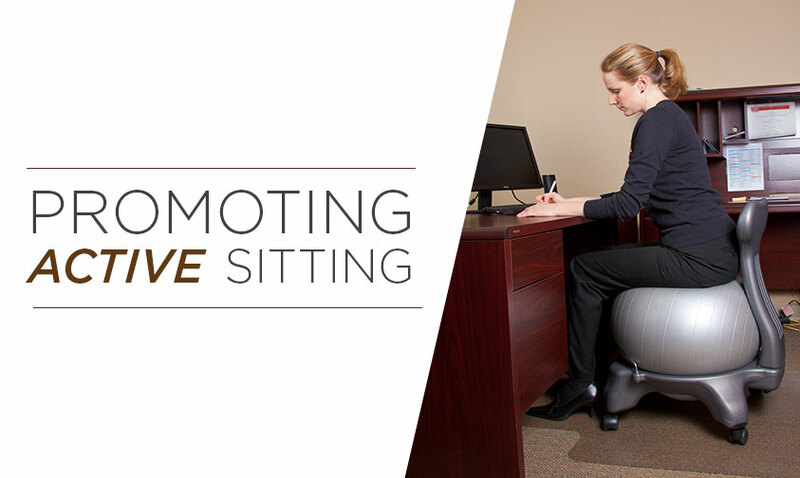 Sitting on a stability ball promotes “active sitting” as you are in a more unstable environment. Your deep core stabilizer muscles (the muscles around your spine that allow you to sit up straight) will be further activated on this spherical seat. No slouching or lounging allowed as the ‘no back’ feature of a stability ball requires you to sit up straight. This will allow you to multi-task at your workstation as you type and improve your posture at the same time. Having a stability ball around will likely encourage you to add old school recess back into your day. Turn your coffee break into an exercise break by using the stability ball to perform exercises such as ball squats, crunches, lunges, etc. You will burn some extra calories and increase your oxygen exchange which will have you feeling accomplished and refreshed. Don’t feel like breaking a sweat; don’t worry because the stability ball also doubles as a stretching assistant. You can stretch your hamstrings, chest, shoulders, and lots of other muscle groups with the help of your new desk chair. Looking for more stability ball exercises? We have the perfect Body Ball Exercise Poster! Click the image below to purchase yours now. Sitting on a stability ball make you a little nervous. We have the perfect alternative – the Power Systems Exercise Ball Chair!